An additional source of biologically active substances of plant origin, essential oils. 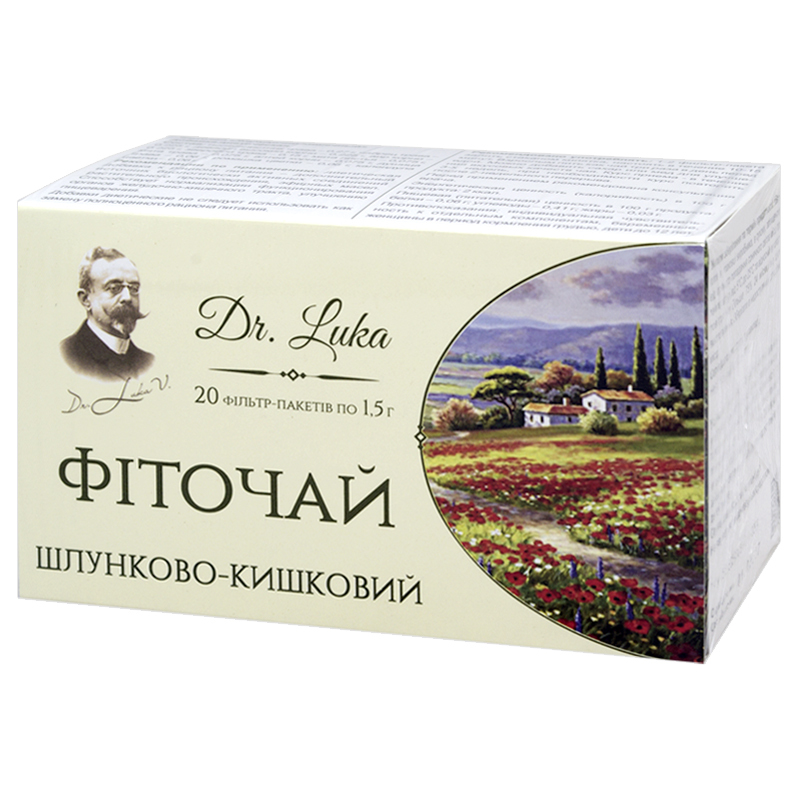 It promotes normalizing functioning of the gastrointestinal tract organs, improves digestion. Yarrow plant — 0.27 g, thyme plant — 0.225 g, elecampane (Inula) root — 0,225 g, sweet flag (calamus) root — 0.225 g, St.-John’s-Wort (hypericum) plant — 0.15 g, mint leaves — 0.075 g, mint plant — 0.075 g, althea root — 0.075 g, marjoram (origanum) plant — 0.06 g, chamomile flowers — 0,06 g, calendula (marigold) flowers — 0.06 g.
Yarrow has spasmolytic, anti-inflammatory, antimicrobial, haemostatic, analgesic, astringent effect, normalizes secretory and motor processes in the gastrointestinal tract, induces appetite. Marjoram has antibacterial, spasmolytic and painkilling effects, stimulates gastric juice secretion. Elecampane has anti-inflammatory, antimicrobial, choleretic, diuretic, toniс effect, normalizes motor and secretory functions of various sections of the gastrointestinal tract, reduces activity of inflammatory process in the stomach. Calamus has toniс, anti-inflammatory, choleretic and disinfecting effects. Biologically active substances, contained in the calamus roots, irritate taste receptors endings, induce appetite, improve digestion, intensify reflex gastric juice secretion, tonify gallbladder, increase diuresis. St.-John’s-Wort (hypericum) has astringent, anti-inflammatory effect, helps regenerating tissues, has moderate effect on bile secretion, induces gastric secretion. Mint contains essential oil, which has spasmolytic effect on unstriated muscles of the gastrointestinal tract; it also has choleretic, anti-flatulent and antibacterial properties. Althea has anti-inflammatory effect, facilitates tissues regeneration. Marjoram intensifies digestive glands secretion, intensifies intestine peristalsis and tone, stimulates bile secretion, has diuretic, anti-inflammatory and antimicrobial effect. Marigold has anti-inflammatory, wound-healing, antibacterial, spasmolytic and choleretic effect, accelerates tissue regeneration processes. Internal use helps regenerating gastric and intestinal mucosa, accelerate healing ulcers and erosions. Proteins — 0.06 g, carbohydrates — 0.41 g, fats — 0.03 g.